Cookies and cream has been a favorite ever since the first cookie fell into the first glass of milk. 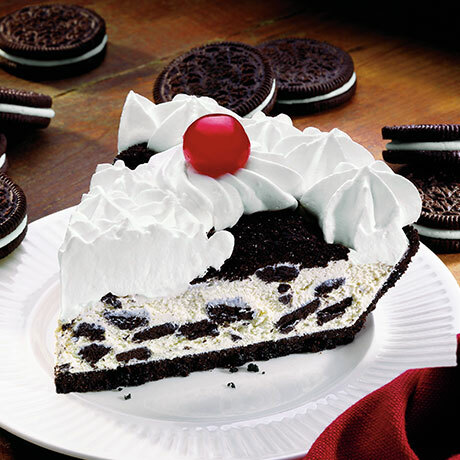 Combining the two favorites in a pie, however, takes it to a whole new level. Chocolate cookies and sweet cream come together like never before in this treat. 10" diameter. 37 ounces. Soda, Monocalcium Phosphate], Salt, Whey [Milk], Natural and Artificial Flavor, Soy Lecithin), Eggs, Vegetable Oil (Palm Oil, Soybean Oil, Citric Acid), Water, Corn Syrup Solids, Titanium Dioxide for color, Sodium Alginate, Natural and Artificial Flavor.